OMG, that costume is freaking hysterical! awesome.. first post. great costume. hilarious!! i don't see 30 clips in her hair though!! LOVE the Peanut's costume! Good work, folks! SO hilarious! And what a cutie. That's great! Where did you get the gold medal? It's very impressive. I can't wait til my daughter can run out and buy me beer! I can't stop giggling at the photo. I just showed it to my whole office and we're all laughing our butts off. Great costume, Peanut! This is much better than the 6-year-old we saw dressed as Sarah Palin. That was a little creepy! I thought this was a great idea but I was speechless by how well you put it into reality! BTW could you post a copy of the fake birth certificate? The "Princess Gymnast" idea was sheer genius. That's hilarious! I love Halloween costumes with a sense of humor, and your girl pulls it off perfectly! So wrong but so funny! Hats off to this year's best Halloween costume. More proof that EVERYONE looks good with blue eye shadow. Awesome costume. Awesome. No, wait... awesomely AWESOME! Very regal, indeed. Blue eyeshadow and red velour. Perfect. What a great way to start the week! Not only an MD post but also a hilarious photo of the Peanut. Great costume! I loved it in theory, I'm floored by the reality! I wish I lived in NYC so I could see this costume in person. I think I would have been wiping tears of laughter from my face. This is a GREAT costume! MD, you when the funniest costume idea EVER. Also, the Peanut is gorgeous and she's going to grow up to be amazing having you guys as parents. Cheers! How funny would it be if you could get a bunch of other 4-year-old Asian-American girls and go as the entire Chinese Olympic team? OMG. Thank you for the hearty chuckle. 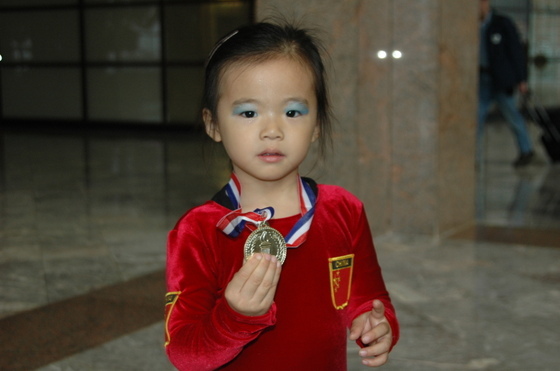 I'd dress myself up as one but I'd look more like OVERAGE Chinese Gymnast. Oh, GAWD, I am laughing so hard right now!!! I wish now that a) I'd lost those few extra pounds from the baby so that I'd look better in a red velour leotard; or b) my daughter had her father's black hair and I'd just make her do it as a 10-month-old. Nicely done, guys, seriously. Awesome! And with that birth certificate she can start doing beer runs for you in just five short years! So creative! I love it. Especially the frosty blue eyeshadow. OMG, my friends and I are here laughing our butts off. Every time we look at this photo, we start howling again. What a GREAT costume idea! The Peanut is absolutely adorable. Dude, that's awesome. She's adorable. the blue eye shadow makes the whole thing! It's been said many times, but it had to be said again: AWESOME INDEED. Maybe I can pull this costume off as well. Oh no wait, I was going as a North Korean spy already. The Peanut is so much more beautiful than any of the Chinese gymnasts! Good god, she is perfection! Frigging hilarious. Best costume EVER. But only one gold medal? She should have at least 5, being the best Chinese Gymnast ever! Can't... stop... laughing. So wrong it can only be right. The eyeshadow is a nice touch btw. I don't see any glitter. Was there glitter? Part of the reason this works is that Peanut is petite and lithe. Joles could never pull this off due to her girth and thigh circumference. You are a genius. Not only have you bested our Halloween costumes by a mile, you are now officially the first parenting blog that Nate reads--and that includes mine.